First Morning Light of the New Year. The photos below are from my 1 Jan morning run – down through the quiet side roads to the river near Sanoop’s parents’ home in Kottayam, Kerala, Land of Coconuts. First Memorable Moment of the year – a pretty serene and lush one at that! When I got back to the house, I was met by freshly brewed coffee, masala-scrambled eggs and a living room and terrace full of lovely people – Sanoop, his parents, my parents and Sanoop’s brother and his wife and their two kids and her parents… Everyone was cheerful and ready to fully enjoy our last full day together for now, after a lovely New Year’s holiday. The day after, my parents left for Denmark, we headed for Singapore, Sanoop’s brother and his family returned to their home in Atlanta and Sanoop’s sister-in-law’s parents hopped back up to their home in Goa, where we all, except for my parents, had spent Christmas. For most of the day, we just hung out in the garden, chatting, reading, listening to music. Farm Party. By the end of the afternoon, we all dressed up to go to the family’s ancestral land in a nearby village, which had been trimmed with fairy lights, fireworks, festive seating in the passionfruit gazebo and food stalls with cooks preparing paper masala dosa, curries and mashed tapioca for people to sit or stand around and eat as quickly as the dishes were made. Sanoop’s dad had invited the 60 closest family members and friends to the Holiday Celebration, and as such, my parents and I got to meet the majority of Sanoop’s and his parents’ first and second cousins as well as several lovely family friends, colleagues and neighbours. Everyone was so cheerful, warm and well-informed – all of them new precisely what each of us does for a living, where we all live and what our hobbies are, haha. I was even gifted a beautiful dress by the wife of one of the many cousins. Slightly embarrassed that I wasn’t as well-prepared, I hoped that a kind smile and a curious attitude would do. I noticed my parents speaking heartily with lots of different people as well, which felt good. They genuinely seemed to be having a good time. So did Sanoop’s parents, even if they were a bit busy with their extensive host duties. At 9pm, when everyone was well-fed, the farm grew empty and silent and we drove home to relax. Apparently, that’s how most parties are in Kerala: high-spirited socialising before and during dinner; quick and efficient munching; spirited talking and laughing as the primary sources of intoxication, rather than alcohol and music; early departure. Especially for the first day of the year, this seemed very appropriate. When we got back to the house, everyone was more or less ready for bed, and at 3am, my parents left. Saying goodbye to them is among my least favourite things in the world, but still I got out of bed to do it. Fortunately, we’ll see each other already in about a month – for skiing in Italy. Until then, WhatsApp texts, voice messages and video calls as usual. Fort Kochi. Tuesday afternoon, Sanoop and I went up to Kochi to spend a few hours in the charming, if touristy, old part of town before catching a late night flight back to Singapore. The architecture and general feel of the area speak of its time as a Portuguese, then Dutch and finally British colony, with the pre-colonial Chinese fishing nets on the waterfront as a main attraction. We had lunch (fresh fish and fresh veggies) in the lush courtyard – featuring beautiful wooden furniture, a pool and well-manicured flower patches – of an elegant boutique hotel, Old Harbour Hotel, right on the water, thinking how lovely it would have been to have brought my parents here as well, but still glad that they got to experience a more ‘authentically Indian’ side to the country on their first visit. We then wandered along the winding cobbled streets to check out various lovely organic silk and cotton clothing stores (Sanoop got me a beautiful blue-green dress with a massive skirt), artisan bakeries and cafes, modern art galleries and a bookstore, where, as the good tourist I am, I bought one book on yoga, one on Ayurvedic cooking, one with short stories on Kerala and an old novel about an English guy travelling around India, haha. 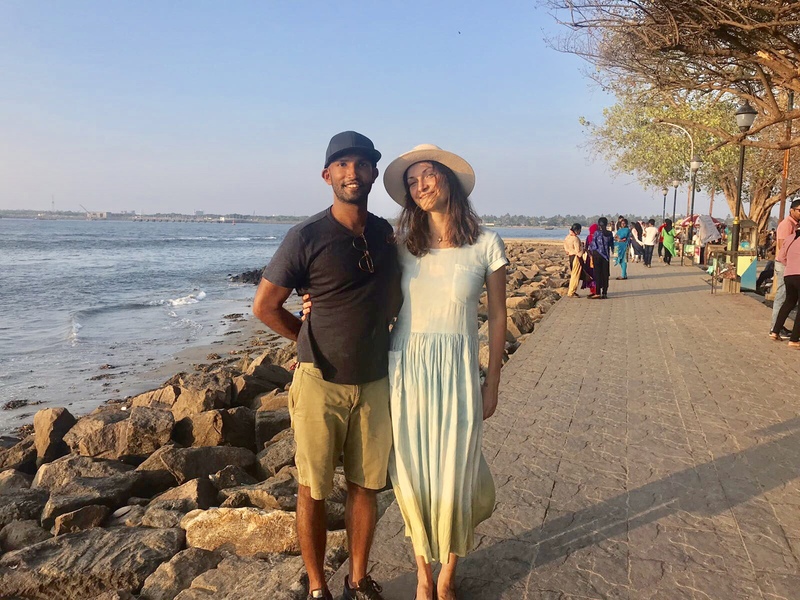 After watching the sun set on the beach along with scores of other tourists, we enjoyed a glass of wine in the courtyard of another pretty boutique hotel, Malabar House, full of impressive art pieces and with an in-house Ayurvedic spa. Appreciating Singapore. Landing in Singapore was blissful as always – gazing down across, driving through and getting back into the light, clean, orderly, quiet and streamlined lion city. Our own home, bed, cooking, routines… On Wednesday night, I went to a Barre Yoga Bar event in Hong Kong Street: starting off with 30 minutes of intense barre with my favourite teacher at Barre 2 Barre, then heading over to Yoga Instiinct for 30 minutes of invigorating yin yoga and finally settling in at a big table at Vasco for cocktails made exclusively for us – with white rum and freshly pureed raspberries. Great to see familiar faces and meet new barre/yoga enthusiasts for a new collaboration that the creative minds behind all three businesses are trying out. It worked perfectly – not too rushed; just a good way to get in the spirit of all three elements; and to feel part of an ever-growing, positive community. Sanoop was still up when I got home: nice to see him after having been apart for 3 hours for the first time in over 2 weeks, haha. For the rest of the week, to get the blood flowing in the morning, in our beautiful spacious apartment full of plants and fresh air flowing in from the always open windows, we did a series of exercises from Elly Awesome’s book, sent to S by Elly herself with a lovely little note on how much she appreciates his positive outlook, and YouTube-yoga with Adriene. We went down to the local market for fresh flowers and fruit. Cooked week-day dinners with ingredients from our organic food box from Frank Food Company. After work on Friday, we met for our own little TGIF: a glass of wine at PS to thank the manager there for watering our plants while we were away, cycling over to Tanjong Pagar for a salad and a single glass of wine at Merchants, then oysters and a mocktail at Gibson, a bar we’d never noticed before but which is wonderful, and a chat with our friend who works at next-door D Bespoke. Slow weekend mornings with our favourite music, overnight oats eaten with fresh pineapple and rambutan from the market, plenty of Indian tulsi tea. On Saturday, we went for a long, gorgeous walk in the Southern Ridges and had old fashioneds at Flagship and dinner with friends at a New Mexican spot, Poncho, and on Sunday, we were working from home and then caught up with friends over dinner at our favourite easy-on-the-wallet Thai spot, Jai Thai, in Purvis Street. Walked home from Bugis with several stops to enjoy the views. Across Boat Quay and the CBD… Marina Bay Sands… China Town… Ah, Singapore! Happy to be here… for a week now. Last year, I visited 10 different countries, spread across 4 continents, on 16 trips. I enjoyed all of the travelling – never felt stressed – always loved going abroad and returning to Singapore. No doubt, this year will be very similar. Starting with Australia on Friday. I’m excited about travels… about enjoying the moments here in Singapore in-between trips… about thinking of life as one journey.. about being with Sanoop on most of our journey(s)… we’re at home where we are, and we enjoy each of the stops for different things. Right now, Singapore feels pretty amazing.